If you were expecting a glossy biopic of Jackie Kennedy, wife of JFK, first lady and international fashion icon, think again, Pablo Larrain’s film is anything but. It plays more like an up-close and personal examination of a woman in trauma. It’s brutal, jarring and uncomfortable viewing at times. The narrative centers upon Jackie’s (Natalie Portman) interview with Life Magazine’s Theodore H White (Billy Crudup), a week to the day, after JFK’s assassination. Using grainy 16mm Larrain skillfully interweaves back and forth between the interview and Jackie’s memories. She talks of happier days, when as the doting wife of President Kennedy and the epitome of feminine domestic elegance she is filmed conducting a tour of the White House, illuminating the public with the changes in décor she had introduced. Nervous and overly poised, she is constantly coached by assistant Nancy Tuckerman (Greta Gerwig) a far cry from the vulnerable, angry, chain-smoking, articulate, media-savvy Jackie being interviewed by White. As she reflects back on the assassination, the familiar scene is depicted with a raw and harrowing intensity that feels as if you’re seeing it for the first time and we are, most importantly, from Jackie’s point of view. We see her husband fall in her lap, the top of his head blown off, splattering her with blood and tissue, a scene that wouldn’t be misplaced in a horror movie. She describes to the reporter how she held the top of her husband’s head ‘trying to keep it all in’, referring to his brain, in disbelief that he’d been killed. Refusing to remove her blood stained clothes for the remainder of the day, a defiant Jackie, no longer the innocent, shy, retiring debutant-wife had had a visceral awakening and was not prepared to pander to the public or the self-important men around her – ‘let them see what they’ve done’, she said. It is not until home alone that night that she showers and the blood streams from her hair down her back – a very chilling scene. Jackie, post apocalyptic event, is very different from the one previously hidden in her husband’s shadow, in spite of the horror she has experienced and her vulnerability, she is able to assert herself with government men and military officials alike – the real Jackie emerges. A blood-stained pink channel suit amidst a sea of men in suits. There are star turns for a stellar supporting cast, John Hurt as the wise Irish priest she confides in and Peter Sarsgaard as Bobby Kennedy, though this really is Portman’s one woman show. 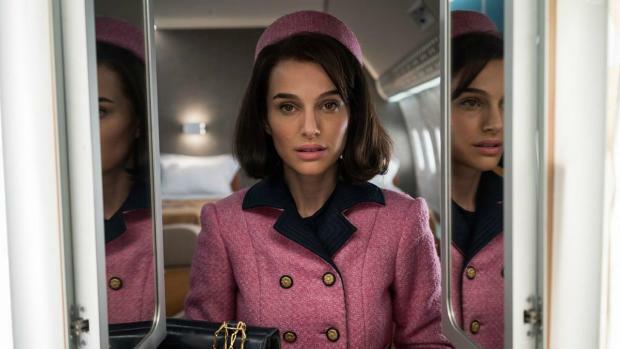 The narrative structure will have its critics as will some of the overt self-awareness Jackie expresses in her off the record interview comments, which show an awareness of her role as an American icon and are not fully convincing. More convincing is her trauma at being stripped so suddenly from the roles she had invested her life in, that of wife and first lady. Her panic is biting as she relays all the wives of presidents who died in poverty and recounts all she has to sell, all whilst stepping into a limousine. The film ends with some wonderful scenes as she remembers the party where she first fell for JFK and the adventure about to begin. Jackie is on general release from Friday 20th January.